What If Nature Boy Ric Flair had Died In the Plane Crash? The Nature Boy Ric Flair. I would hope that every wrestling fan out there would know who he is, and they better know about his accomplishments. 16 World Heavyweight Championships, NWA (JCP) United States Champion, NWA (JCP) Tag Team Champion with Greg Valentine, Mid Atlantic Heavyweight Champion, WCW United States Champion, and I'm sure I missed a few or many. Fact is Ric Flair won 22 World Championships! Reigns 17-22, while unofficial, actually happened during his first two stints as NWA World Heavyweight Champion. I'm not here to argue how many titles he won, but what if he hadn't won a single World Title, and all because of one fateful day on October 4, 1975. Twenty years and a day after Doc Brown came up with the idea of the flux compacitor, Ric Flair was on a plane with Johnny Valentine, Bob Bruggers, Mr. Wrestling, and David Crockett. They were in Wilmington North Carolina when their plane crashed paralyzing Johnny Valentine and killing the piolet! Flair himself suffered a broken back, three places it was broken in fact. Flair, Mr. Wrestling, Bruggers, and Crockett survived with their lives, but I think it's safe to say that neither man was the same again. Mike McCord, aka Austin Idol, was in a plane crash of his own and grew a fear of flying, which is why he never went to the WWF or the NWA/WCW. 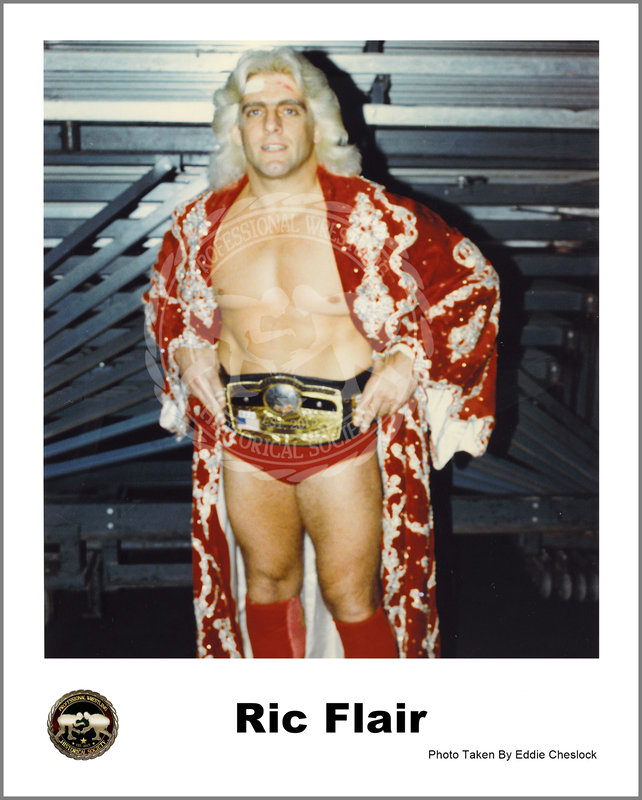 Flair spent months in traction and returned to the ring in 1976 to feud with Wahoo McDaniel. What if he died? You ever wonder about that? What would of happened to Crockett promotions without the Nature Boy Ric Flair? Their biggest draw! I mean sure they had Dusty, Magnum, The Koloffs, Steamboat, Piper, Valentine, and a whole slew of talent! Who would of got the big push though? Well, I'll give you my answer, and I believe it would have been Steamboat! Steamboat had many battles with Flair, hundreds in fact. Each one better then the previous match, and I'd still pay to see it today! ​Now on September 17, 1981, Flair won his first World Title from Dusty Rhodes. So we'll take this Alternate reality, Alternate World Of Wrestling from there! Who would defeat Dusty on this day if Flair had died in the plane Crash? Dusty Rhodes defends the NWA World Heavyweight Title in Kansas City, Missouri. His opponent would be one of Dusty's greatest opponents over the years, a former NWA World Champion, his name is Terry Funk! Terry Funk is a fighting champion, defending the title all over the globe in places such as Australia! Terry Funk Beats Wahoo McDaniel. Terry Funk beats Giant Baba. Terry Funk beats Billy Robinson. Why Kent? Where my family originated so I got a soft spot for it! Ricky Steamboat beat Terry Funk to win the belt! Ricky Steamboat beats Greg Valentine. From August 27th-September 3rd, Steamboat faced Terry Funk in a series of Cage Matches! He would win all of 'em! Terry wouldn't hold the world title ever again! September 4th, 1982 Steamboat defends against a surprise opponent! Ricky Steamboat beats Dusty Rhodes. After this match, Dusty shakes Steamboats hand, and then TURNS ON HIM! That's right! Dusty Rhodes went from The American Dream to The American Nightmare! The World is Shocked! Steamboat is shocked, but he's got revenge on his mind! He'd get some while defending the NWA World Heavyweight Title against Dusty in Japan! Ricky Steamboat beat Bruiser Brody by disqualification. Ricky Steamboat beat Stan Hanson. Then Steamboat and Rhodes continued their feud in Georgia. Ricky Steamboat beats Dusty Rhodes by disqualification. TAG MATCH at the Omni! A surprise partner for Steamboat! Dusty Rhodes and Harley Race beat Ricky Steamboat and Terry Funk! Dusty Rhodes beat Ricky Steamboat to win the belt! This is what may of happened if Flair had died in the Plane Crash on October 4, 1976! I believe that Steamboat would of been the man to step up and be the next in line, but it could of been Greg Valentine, or Piper, or Slaughter, or...well you get the picture! Who do you think would of been the next in line if Flair died on October 4th, 1975?